Today, I have nothing for you. I wish I had gotten done the yoke collared pinafore I am making for Smootch that is languishing half finished draped over the sewing machine. I wish the doll I plan on making of the captain of the Titanic for our young friend J's birthday this Saturday was also done. Right now the doll is a collection of half drawn pattern pieces as I still can not figure out how to make the double breasted coat with the fancy schmancy collar. I wish I had managed to finally figure out how to organize our craft supplies in this house without shelving but I can't seem to get past doing the dishes and the boxes in the basement lay waiting, yet to be unpacked, to even get around to doing this frivolous stuff like organizing. Instead of doing these things I have been playing at just living. The portion of my life dedicated to fitness and roller derby is starting to take over epic portions of time. My time with the children is dedicated to reading books and negotiating trade wars over tape measures and flash lights. There has been some long walks in the fog, as tiny flakes of snow slowly cover the ground. Thoughts of the upcoming winter slow me down, make me more likely to watch Glee in the evenings than to sit at the sewing machine. Instead, since I'm already there, I've started to pay attention to how sewing, needlework and crafting in general is presented to my children through books. 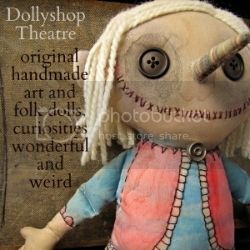 The picture books I read to the children are often very kind to creative people, particularly women who make dolls, clothes, or blankets. Our favorite books about handmade crafts on the shelf right now are Hannah and the Seven Dresses and The Quiltmaker's Gift . Our ultimate favorite book about creative work, though not about handmade items, is Ain't Gonna Paint No More. I haven't run across many negative portrays of the handmade in books, perhaps because writers and illustrators recognize and appreciate other forms of creative work. 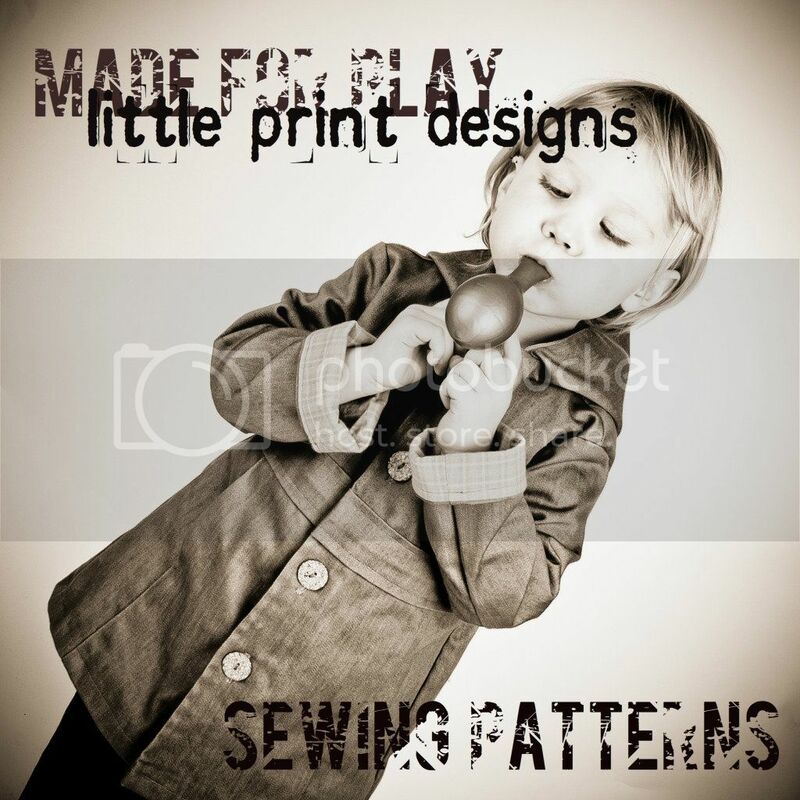 There does seem to be a significant amount of distributing material that is based not so much upon dislike of the traditional home crafts so much as cluelessness. I have mentioned that I have been spending a lot of time reading Dora the Explorer to Birdie Boy because not reading Dora to him would be like kicking a puppy. From Dora's Chilly Day . 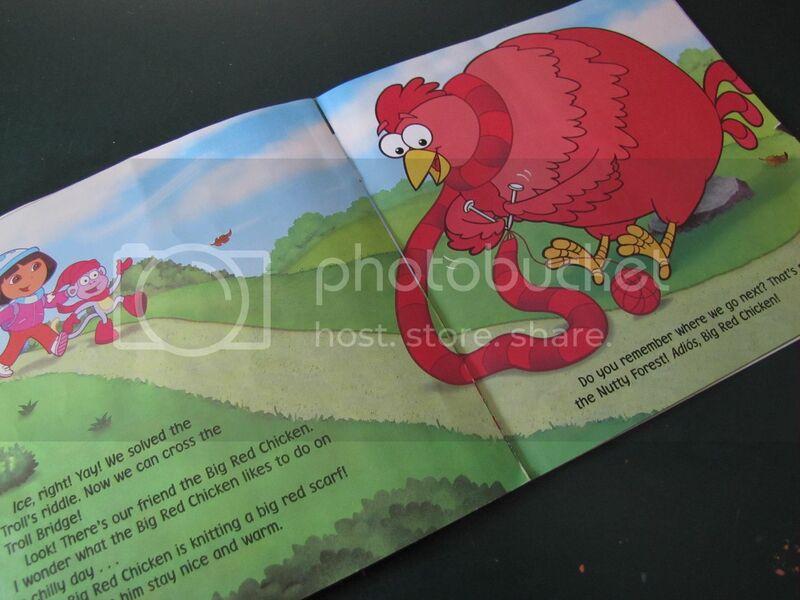 Can someone tell me what the heck Big Red Chicken thinks he's doing? I'm not much a knitter, but I do know that generally the scarf would actually be tied onto a needle. Perhaps this some sort of funky double needle crochet? It looks to me that he is actually trying to nail some strings to themselves, but a nasty case of the shakes is interfering with the process. Perhaps the shakes is indicative of an even bigger problem for Big Red Chicken? I'm a little flabbergasted. So much so, that I think perhaps Big Red Chicken is actually doing something totally legitimate and I am the one who just isn't familiar enough with knitting to figure it out. What do you think, is Big Red Chicken nuts or is it me? Oh, Big Red Chicken is nuts all right. You ask if you are nuts or a three meter tall Red Chicken with eyes like snowballs, trying to knit with some strange kind of wool glued to two nails? The only thing I can suggest is that Big Red Chicken has just dropped all his stitches? Or perhaps he is attempting to start a fire with two nails and some acrylic yarn? He sure as heck ain't knitting, the stitches aren't on the needles at all. 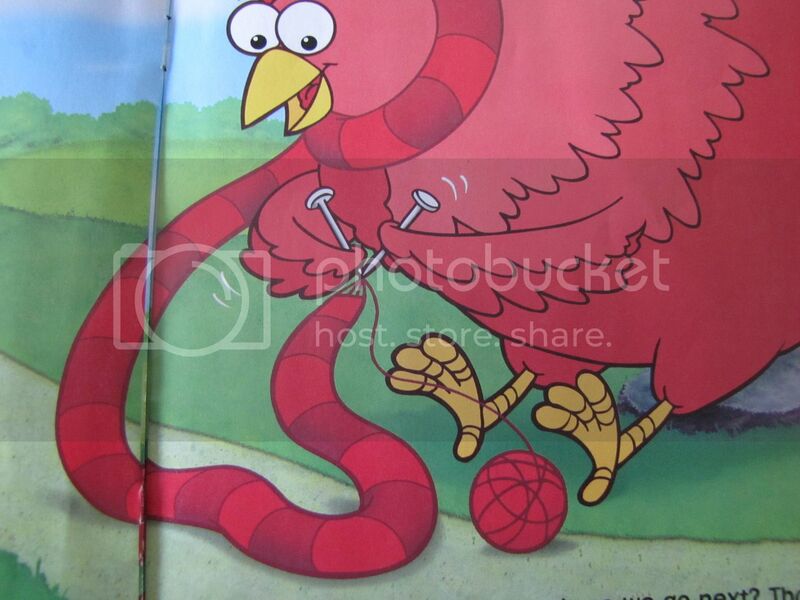 Big Red Chicken's artist obviously does not know how to knit! The wiggly needles are OK, but there should be stitches on the needles. Reminds me of the Quilted Northern commercial that showed women quilting with knitting needles! And no, that's not a different kind of needlework being shown! I agree, it's clearly a case of dropped stitches. That or the illustrator has never seen knitting in action! Hilarious! This reminds me of a Quilted Northern commercial a few years ago where the quilting bee ladies were "quilting" the toilet paper with Knitting needles. Major editing flaw! But it gave me a good laugh every time I saw it. Ha! I am fellow Canadian and love your blog. I feel your pain when it comes to organizing art supplies - one thing that has worked for us is using bags (either ziploc or recycled clear vinyl bags that crib sheets, etc. come in) and hanging them using pants hangers with the clips on them (I get them free from superstore - they are always more than happy to give me a few). Doing it this way, the kids can see what's in the bag, I can (sort of) organize it by project/material and we can actually find things. We use our front closet as we don't actually hang coats in it. I love the big red chicken. You're right about the knitting though. and how is the chicken managing the stripes with only one ball of yarn. Hmmm. Ok, now can we analyze the super yarn that Baba uses in The Mitten? Oh, Jan Brett's The Mitten! That is a great story, one of Smootch's favorites. My guess is that Baba coats her needles with love and that gives it extra strength and warmth. But, maybe I'm just feeling quite gooey this morning and later on today, after driving through traffic, I may mock The Mitten mercilessly. Thanks all for reassuring me of my sanity! Knitting? It appears to me that Big Red is in the fight of his life. See how the giant red striped snake/slug hybrid is trying to strangle him? Big Red is clearly trying to rip off its strangely metallic looking eye-stalks. A bit violent for a childrens book. surely the illustrater has not a clue! 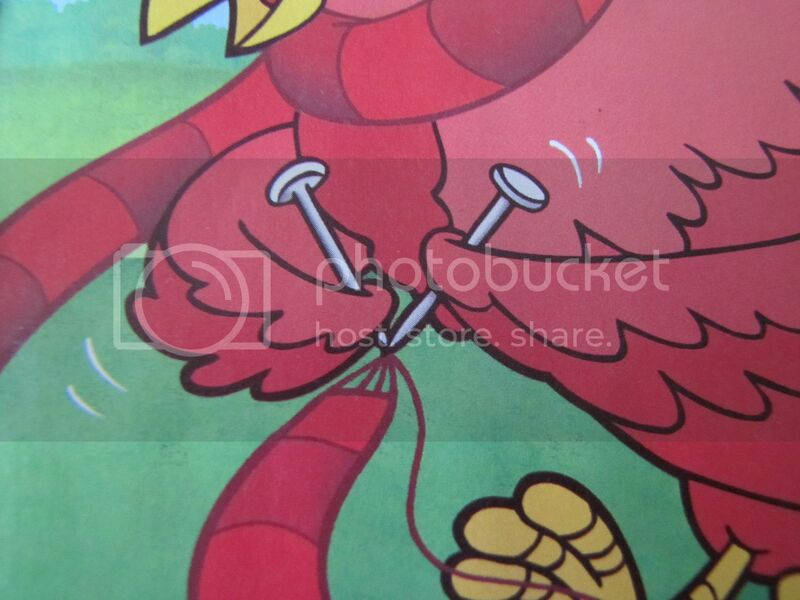 but in the name of making the picture make sense, I say, big red chicken has just successfully cast off his very last stitch! The scarf is complete and therefor, no stitches remain on the needles. Job well done, Big Red!